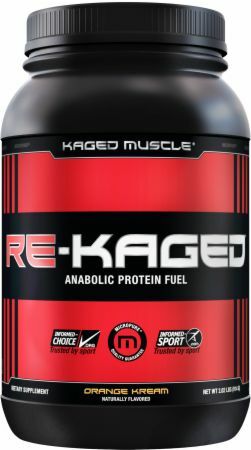 Re-Kaged by Kaged Muscle at Bodybuilding.com - Best Prices on Re-Kaged! Our bodies need all of the nine essential amino acids (EAAs) in order to build muscle. * Don’t shortchange your results during this important anabolic window by using a post-workout product that only contains BCAAs. Each serving contains 28 g of non-GMO whey protein isolate, 7 g of glutamine and glutamic acid (4 g naturally occurring from WPI plus 3 g of free form L-Glutamine), patented BetaPower® (betaine), patented creatine HCl and the super enzyme ProHydrolase®, which breaks down (hydrolyzes) whey protein into smaller particle sizes for enhanced absorption.  The difference between hydrolyzed whey and RE-KAGED’s whey protein isolate plus ProHydrolase® is that with RE-KAGED® the protein is hydrolyzed at the point of consumption vs. being chemically treated during the manufacturing process into very small peptides and then dried. As a matter of fact, if you don’t drink RE-KAGED® within 15–20 minutes of mixing you will start to taste the flavor get bitter like hydrolyzed whey protein. This is due to the ability of ProHydrolase® to rapidly hydrolyze (break down) the whey protein isolate. If you are looking for another product to compare RE-KAGED® to, you are wasting your time! Nothing on the market even comes close or has the same ingredients. Many of the ingredients we use are unique and exclusive to Kaged Muscle®, which means you will only get them from Kaged Muscle®. They are loaded with artificial flavors, colors, and low-quality ingredients. Fast-acting carbs, however, can be effective for triathletes, long distance runners, cyclists, and events that last more than 3 hours with continuous activity. The answer is simple – our ingredients meet MICROPURE® standards which means they are third party tested for purity and quality! In return for a premium price, Kaged Muscle’s vendors and manufacturers commit to strict ethical, quality, and testing standards, ensuring our ingredients are manufactured with care. Complete source of: Essential Amino Acids (EAAs), Conditionally Amino Acids (CAAs), and Non-essential Amino Acids (NAAs). Being an easy-to-digest protein source, whey isolate breaks down quickly to provide a rapid influx of aminos to muscles, making it a perfect post-workout protein option.  We guarantee that RE-KAGED® contains 100% premium whey protein isolate and does not contain any amino spiking ingredients or mid-grade whey protein concentrate. Many companies combine whey isolate and concentrate which is not optimal for you – only for the company trying to cut costs. Whey protein is one of the best sources of all nine essential amino acids that the body is unable to produce on its own. * However, whey protein must first be processed into a usable form, which includes essential amino acids and beneficial peptides (i.e., di and tripeptides). To be effective, whey protein must be broken down into a smaller particle size within approximately 90 minutes of consumption. This transit time represents the time from which the whey powder passes from the stomach through the small intestine where digestion/absorption primarily occurs; from there it will be assembled into muscle protein (a bio-usable form). When whey protein is not broken down into the smallest composition, large peptides are created that can cause discomfort such as bloating, nausea, and cramping. These symptoms should not be confused with lactose intolerance. Lactose is not present in whey isolates; therefore the underlying cause of the discomfort is peptide sensitivity.  ProHydrolase® breaks down large peptides reducing the potential for discomfort that can comes from consuming whey protein. As an osmolyte, betaine plays a role in protecting cells, proteins, and enzymes from common stressors (e.g., low water, high salinity or extreme temperature). This practice is deceiving and unethical. It’s what we at Kaged Muscle® call using “borrowed science” to dupe you, the customer, into thinking their product is the real deal, when in fact it is an untested copycat with no direct research or safety data. The real deal BetaPower® used in 7 Human Studies is 99%+ pure and derived from the molasses of sugar beets. Patented Creatine HCl It is the original creatine hydrochloride (HCl). Patented creatine HCl has no need for a loading phase or cycling off. contains no sugar, no fillers, no binders, and no buffering agents. Casein, Milk Protein Isolate, Egg Albumen, Corn Syrup, Soy Lecithin, Artificial Flavors, Cream-Filled Chocolate Cookie Pieces (Sugar Enriched Flour), Soybean, Palm Oil with TBHQ, Sugar Degerminated Yellow Corn Flour, Cornstarch, Artificial Flavor, Soy Lecithin, Acesulfame. NO Borrowed Science aka "Generic Ingredients"
What really sets RE-KAGED® apart from the competition is the attention to detail that goes into sourcing the world’s best ingredients. Yo this is it. The one true protein for recovery. I'd be a freaking ambassador for this protein. In combination with the Pre-Kage you'll be a beast in and out of the gym. Everything about it is great only improvement would be taste as in other flavors. But in trying to maintain quality I can understand and accept. I gave the taste a 10 even though I can find wheys that taste more like chocolate milk or whatever. The lack of artificial flavors is FAR more important to me and I’m just slamming it post workout anyway. I barely notice the flavor which means it’s not a bad taste and is just fine to me. 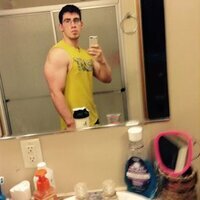 I use Rekaged along with Prekaged and Intra as a workout supp strategy and have found it to be highly effective. 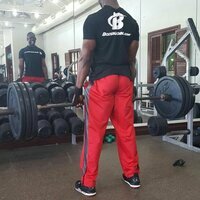 Some of my workouts can be quite grueling and as an older lifter recovery is everything. Even a double serving after say a brutal leg day disappears in my gut in minutes and doesn’t give me full almost quesy feeling that some things can. 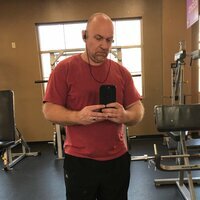 I bounce back very quickly session to session which certainly has a lot do with on point diet however some credit has to given to the Kaged Muscle combo. My strawberry shakes contain Greek yogurt, pineapple juice, a small banana, flax seed and some vanilla extract to round out the flavor. This one.... it's the bee's knees! The flavor is breathtakingly strawberry, more than any real strawberry I tasted in years. I am sure his orange is equally mindblowing. Now, if this company did a proper chocolate flavor, not that milky stuff most others make, I would sign over my paycheck! Help you get recover faster and gain muscle and taste is amazing. Last month my local GNC had a good deal on Kaged products so I thought I'd give it a try. Re-Kaged is by far the easiest protein to "get down" after a grueling workout. 28 G whey protein, 2 G carbs, a little Glutamine (3 G) and Creatine (1.5 G) and you got everything you need in a protein powder, right? Wrong! Add the fact this stuff mixes easily with water and tastes great. NOW YOU HAVE EVERYTHING YOU NEED IN A PROTEIN POWDER! Get It! Loved this product! Great taste. Taste is horrible. Doesn't taste like strawberries or lemonade. 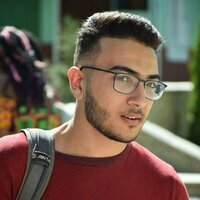 I love KM products but I do not reccomend this one here. Stick to chocolate for protein. Outstanding quality post-workout protein. The protein itself is very fine and mixes easily, I mix one scoop with 2% milk within 30 minutes after a workout. I must say I was very hesitant about a strawberry lemonade flavored protein, as I'm used to the traditional chocolate, vanilla, cake batter flavored proteins, but this stuff is seriously delicious and very easy to drink. No bitterness or weird aftertaste at all. I must say I have yet to find a Kaged product that I didn't like. As far as what I didn't like, my biggest gripe is the price. I like to use two scoops of protein when I make a shake and you just can't do that with this protein unless you want to spend close to $100 a month on it, it's very expensive for the price per serving. I understand it's quality whey-isolate protein, but $40 for 20 servings is a little steep. The second thing that I've noticed about this protein is you don't want to fill your shaker bottle up all the way with this stuff, as it tends to create A LOT of foam when you use a shaker bottle. After I shake it up I'll open the top to my shaker bottle and let the foam settle for a few minutes before drinking it. This flavor is awful. I love Kaged products however I dread having to drink this every morning, can't wait to finish the container. In addition to containing 1.5 grams of creatine in a serving this stuff is the easiest protein to mix making it simple to consume at any point during the day. With standard whey supplements I find them clumpy when mixed in a shaker bottle. However, Re-Kaged mixes smoothly with a shaker bottle and I've yet to taste any clumps. The taste is well...it tastes like protein powder. But if you mix it with cold water and about 4oz of a calorie free orange Powerade it tastes a helluva lot better. Also, since its isolate I find it's a lot easier on my digestive system, no protein *****. Coconut oil powder (coconut oil, maltodextrin, modified food starch), natural flavors, citric acid, sunflower lecithin, beet root extract (color), guar gum, silicon dioxide, stevia, sucralose. BetaPower® is a registered trademark of DuPont or its affiliates. ProHydrolase® is a trademark of Deerland Enzymes, all rights reserved. Patented Creatine HCl is covered by one or more of Vireo Systems, Inc. U.S. Patent Nos. 8,962,685, and/or 8,354,450, and/or 8,026,385, and/or 7,608,641. Directions For Re-Kaged: As a dietary supplement, mix one scoop 8-12 ounces of cold water and shake vigorously. Take one serving upon rising in the morning and one serving immediately post workout. For maximum results consume two servings per day on training days. For non-training days consume one serving upon rising in morning and one serving mid-day between meals. Warnings: Consult your physician prior to using this product if you are pregnant, nursing, under 18 years of age, taking medication or have a medical condition. 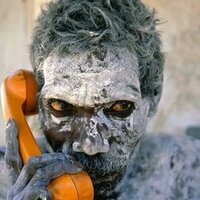 Immediately discontinue use and contact your physician if any adverse reactions occur. Keep out of reach of children. Exposure to moisture or heat may cause powder to clump or harden. Store in a cool, dry place, avoid direct sunlight, humidity and high temperatures. Replace lid securely after each use. This product contains a silica gel pack. Do not eat. Contents may settle during shipping. Sold by weight, not volume.